Chile's unique geography makes it one of very few grape-growing regions in the world where original European rootstock has been unaffected by phylloxera. 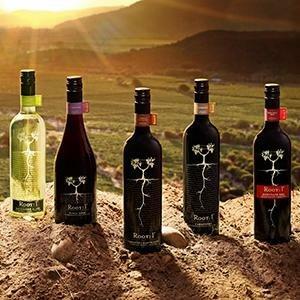 While most vineyards around the world are planted on grafted rootstock, Root:1 grapes are grown on pure, ungrafted roots, producing wines of outstanding quality, with pure fruit flavors and authentic varietal character. Chile's isolation, protected by the mighty Andes to the east and the Pacific Ocean to the west, allows grape vines to remain on their original rootstock in their purest form. The country's optimal climate and soil conditions help produce consistently outstanding grapes each year. The cooler coastal vineyards of Casablanca are ideally suited for Sauvignon Blanc and Pinot Noir, while Cabernet and Carmenere flourish in the warm, sun-drenched central valley of Colchagua.